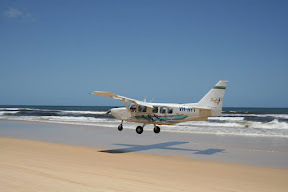 Fraser Island is just north of Brisbane. Completely made from sand which has drifted along the mainland shores. Picked up by a double decker bus, which seemed like a bad sign since I’d imagined a small 4WD mini-bus. Get the ferry and leave the bus behind and ride on the deck. Nice view and some breakfast for the 30 min journey over to the island. 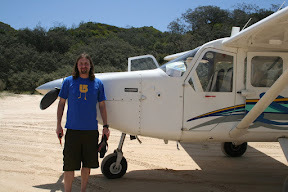 Arrive at the island and board a massive 4WD truck/bus for about 30 people. Better than I was expecting. Tour guide is a real character and has some great stories to tell. Apparently the island is made completely of sand which had forests grow on top and then get covered in sand again, six times over. so it’s a massive island with rain forests, hills, desert and temperate forests fresh water lakes. Hard to believe it’s all on a bed of sand, but it is. Take a walk around a creek at Central Station with it’s crystal clear water and sandy bed and then headed over to the beach. And what a beach, it is in fact classified as highway you’ve got 4WD cars, 4WD buses, aeroplanes landing on it and people milling about. 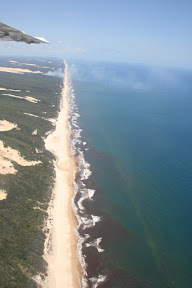 It’s called 75 mile beach…so plenty of space then! 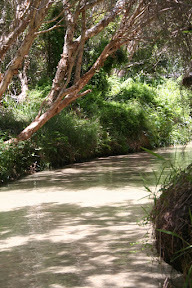 Stop to walk up a Eli Creek which is brilliant in the clear water and feels tropical. 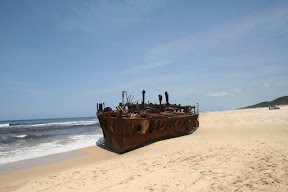 Next stop is the ship wreck. A boat bought by the Japanese which go into trouble in a storm on the way back to Japan and ended up here. Ozzie air force used it for target practice so not much left of it really. Land back down the beach and pick up the bus for lunch with Charlie, guy from Sheffield I met on the bus, and a couple of backpacker girls from Ipswich. 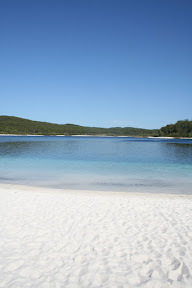 After lunch it’s a 30 min ride up to Lake McKenzie and the highlight of the trip. The Aborigine name for the island roughly translates into paradise and this freshwater lake explains it. It’s totally isolated at the top of a massive sand hill surrounded by rain forest. There’s no streams or water coming in or going out, apart from rainwater and evaporation, so no plant or animal life. Which means crystal clear waters and great swimming. Perfect sandy beaches with the best sand…paradise! Swim for half an hour then it’s back on the bus to catch the last ferry to the main land.